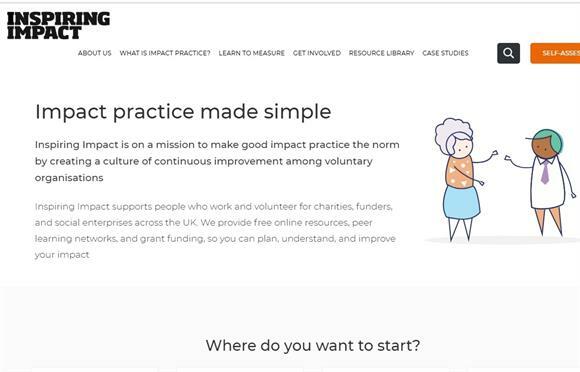 The Inspiring Impact project has launched a new website and free materials to help small and medium-sized charities understand and increase their impact. The website, which is funded by the National Lottery, has a number of free how-to guides and self-assessment tools, as well as research reports, diagnostic tools, outcomes frameworks and surveys. Inspiring Impact has been running since 2012, and is funded by Access – the Foundation for Social Investment, the City Bridge Trust and the National Lottery Community Fund. The think tank NPC, the National Council for Voluntary Organisations, Social Value UK, Evaluation Support Scotland, Community Evaluation Northern Ireland and the Wales Council for Voluntary Action all help to run the programme. The new website’s tools and resources have been designed with input from 200 charities and social enterprises, and 110,000 people have already used the resources on the website. One of the tools included is a "data diagnostic", which provides tailored recommendations for charities on what information they should be collecting. Joe Ferns, UK funding director at the National Lottery Community Fund, said charities could use the new website and tools to better plan, measure and improve their impact. "By creating a culture in civil society of continuous improvement, with the help of peer learning networks and free online resources, more and more communities across the UK can thrive," he said.